It’s science time! 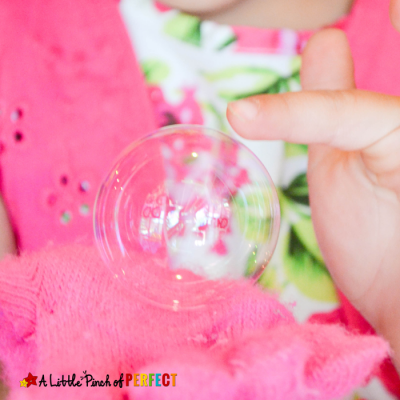 Grab a bag of popcorn and get ready to learn with this simple and inexpensive kid activity. We recently did Apple Graphing and I thought this would be a great way to review graphing along with practicing life skills like measuring, pouring, counting, and weighing. 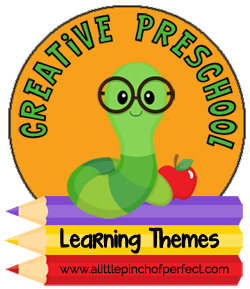 This post is part the first post of the school year for our Creative Preschool Team. Make sure to check out more Corn Activities to do with your kids at the bottom of this post. 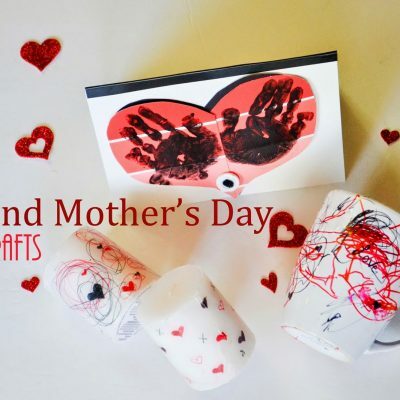 Last year’s themes included: Shapes, Science Experiments, Learn About Food, Fine Motor Skills, Hair & Body, Fairy Tales, Ocean, Rain Forest, Flower & Plants and Solar System. The day before we did our experiment I let the kids play and explore with our corn kernels so that when it came down to our experiment, they would be ready to follow directions. 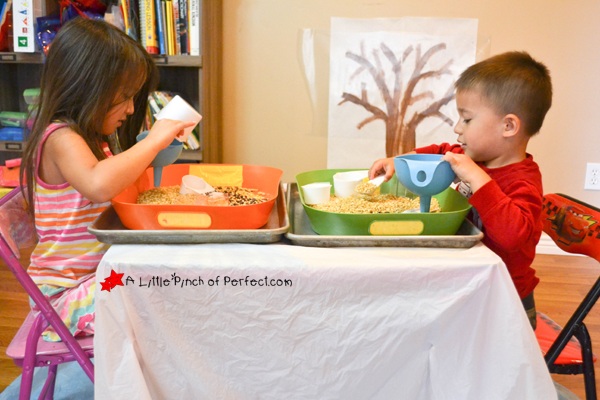 It was certainly a fun Sensory Activity–the kernels are fun to dig into, pour, feel, and even listen to as they plink into the bowl. They used measuring cups, spoons, containers, and funnels. Little Tiger realized that when she used her large measuring spoon the kernels would get stuck in her funnel, but if she used her small measuring spoon they could flow through. Little Dragon pointed out the largest spoons and cups and observed that they held the most because he could make big scoops. We watched this slow motion YouTube video of popcorn popping (by Diogo-Just me) and my kid’s thought it was so cool! I explained to them that corn kernels pop open to make popcorn because inside the kernel is a little space with a tiny amount of water. When the water gets hot enough in the microwave, it builds up pressure and finally explodes open. 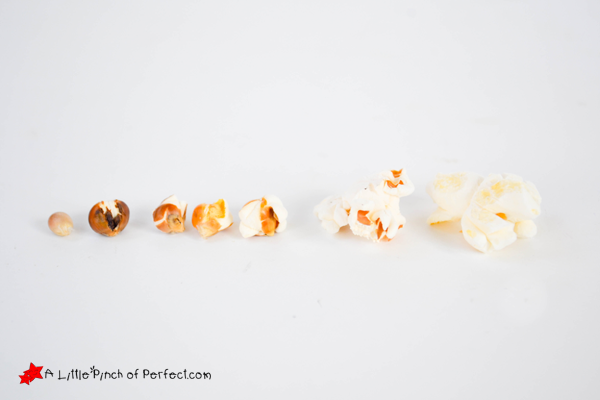 Then I found some “granny” kernels (do you call then that?–you know, the ones that aren’t popped all the way) and we lined them up in order from beginning to end of the popping process. This experiment reminded me of our Soap Blowup Experiment, which also results in something small turning into something big due to heat and tiny air pockets like the ones inside popcorn kernels. 1. Print out the graph; make a bowl of corn kernels and a bowl of popcorn. I suggest also having a small bowl or popcorn designated as the eating bowl because I guarantee your kids will want to eat during this activity. 2. 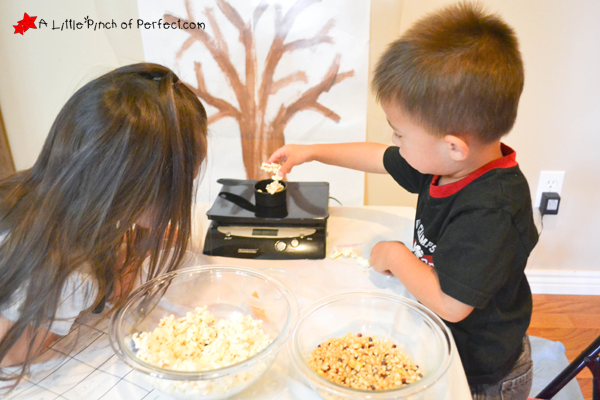 Have kids feel, touch, smell, and observe the kernels and the popcorn and record their observations. 3. 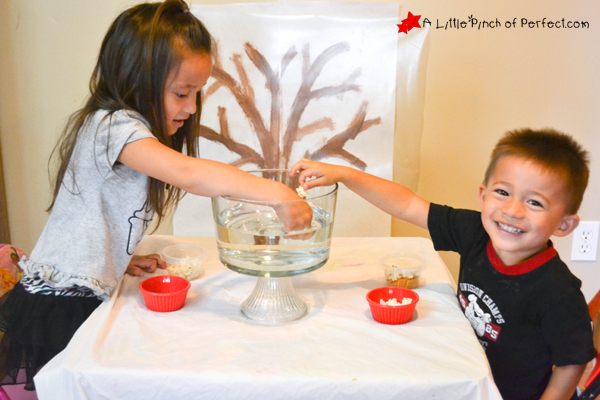 Give kids a cup of water and have them test the kernels and popcorn to see if they float or sink in water and record their observations. This was my kiddos favorite part and when we were all done with the activity they did this step until they had emptied our bowls. 4. Fill the measuring cup up with popcorn, count the popcorn, and record the number. Fill the measuring cup with kernels and count them. We counted to 200, which appeared to be about half, then we estimated that we probably had around 400 kernels. The goal is to realize that even though we had 1/4 of a cup of each item, due to size, we did not have the same amount when we counted them. 5. Weigh the kernels and weigh the popcorn, then record the number. Our scale wasn’t sensitive enough to weigh 14 pieces of popcorn so I had the kids add some pieces until it read .1. 6. Review graph and talk about observations. Download available via Google Drive. You do not need a Google account to download. It’s always a good idea to laminate (affiliate link) printables or put them in a dry erase pouch like our homemade one. 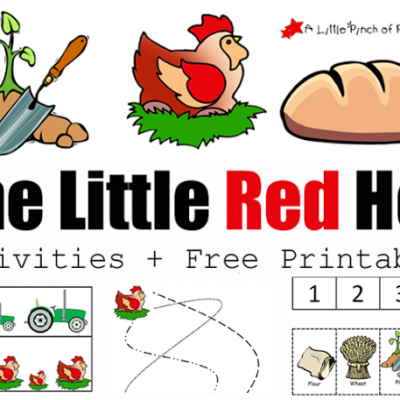 Please share and pin our printable :)While you are here, take a look at more of our Free Printables. So much exploring and experimenting! I never would have guessed corn could be so educational! 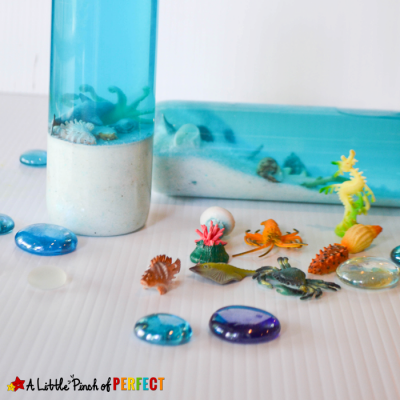 Love this easy science experiment. We are big popcorn eaters here, so we'll definitely try it out. Thanks for sharing Katie! Your pictures are absolutely adorable! And I love this idea for fall! 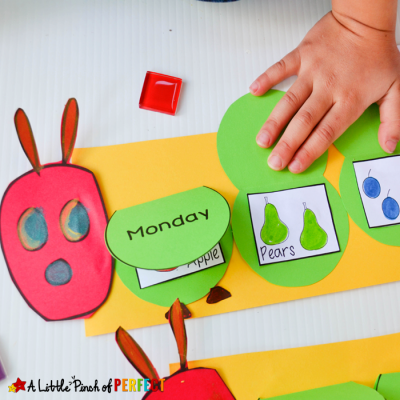 Thanks for sharing on Toddler Fun Friday! Hi Ali, Thanks so much! The kids had a lot of fun, which always makes for some great pictures and activity!